The Peach Keeper by Sarah Addison Allen is a story about the incredible bonds of friendship, family, and how that passes down through the generations. 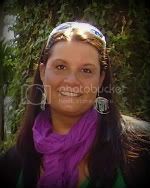 Willa Jackson returned to her small Southern hometown, after the death of her father to live the sort of life she thinks would make her father proud. She's settled into a small, quiet predictable life that is dramatically different from her teenage years. Willa's family helped build the small town of Walls on Water, North Carolina and resided in a beautiful, glorious old mansion, the Blue Ridge Madam. After the town fell on hard times, her ancestors were forced to abandon the house which fell into disrepair over the years. Willa's former classmate, Paxton Osgood and her family, undertake the Madame as a charitable project. The two are reconciled when a skeleton and some other odd remains are found under a lone peach tree, forcing them to both take a look at their past and their future. Having never read an Allen novel, I wasn't sure what to expect but was very quickly drawn into the characters and their stories. The story flows easily as it takes you down the path of high school acquaintances who have grown, changed, and reunited in their hometown. Some are surprised at the path others have chosen, while others haven't changed. Set against the picturesque background of a North Carolina mountain town, this story examines the choices the characters make, the past they thought they knew, and the reality of their ancestors lives. The mystery of the skeleton beneath the peach tree brings the acquaintances together in a way they never imagined, intertwining their pasts and their futures. I really loved reading this novel and highly recommend it if you're looking for a fast weekend read. Once I started I didn't want to put this book down and am anxious to check out Sarah Addison Allen's other novels. For more information on this book check out the author's website. 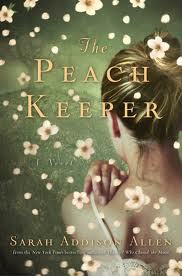 Additionally, the publisher has graciously offered to send one of my readers their own copy of The Peach Keeper. Simply leave a comment on this post by next Wednesday. I'll draw the winner via Random.org and announce the winner next Thursday. Disclosure: I was provided a copy of this book for review by the publisher and TLC Tours. The thoughts and opinions in this post are my own.